We spent most of this flexible travel day hanging around Porto before driving a few hours south to Figuera do Foz where we would be spending the night. We had a sweet start to the day after seeking out one of Portugal’s most legendary treats: the Pasteis de Nata. It’s a Portuguese egg-tart pastry cooked to a crispy-outside, gooey-inside perfection and then dusted with cinnamon. We hunted some great ones down at Manteigaria, and knew from the very first bites that these would be the first of many Pasteis doomed to be consumed via our new sweet obsession. The remainder of the day was spent with our new friends Justin and Bella who had invited us to hang out and paint some wall art in a Porto suburb. We enjoyed snacks, sun, and spray at a remote legal wall surrounded by old stone houses and their flourishing garden plots. 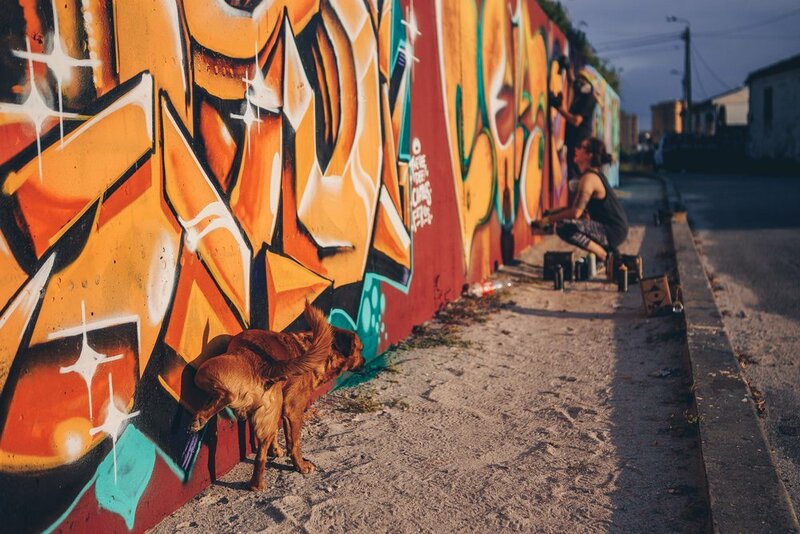 We also made fast friends with the neighborhood dog, who, while being quite amicable and appreciative of our attention, clearly had something to say about Max’s artwork.